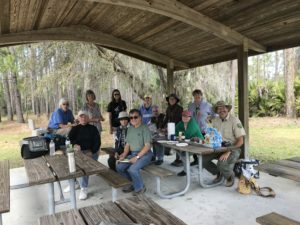 At 8:00 on Saturday, Feb. 9th, 17 people gathered at Bear Pond in Seminole State Forest with park biologist, Ralph Risch. The trees were shrouded in fog but as we gathered a low flying, immature eagle flew overhead, giving us a “under-view” of the mottling of brown and white feathers. It was not long before a couple of mature bald eagles soared over the pond. The walk around the “Bear” was quiet except for an occasional bird call. The birds were waiting for the wind to settle and the sun to break through the fog. 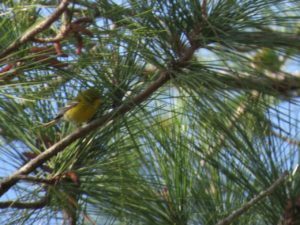 Pine warbles, mourning doves and white-eyed verios were spotted. A small flock of wood ducks flapped across the pond. Onward to the scrub! The Jays displayed their cerulean blue wings as they perched on the highest tips of the very short scrub oaks. 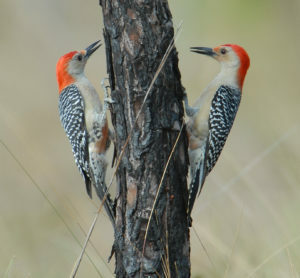 Ralph explained the specific habitat that these indigenous birds to Florida require. 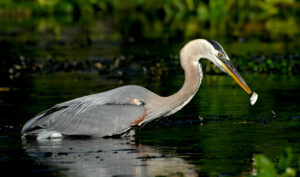 They live in community and each bird has a responsibility to uphold. Some take turns being the sentinel bird to warn of hawks entering the territory. Others feed the family. Some privileged families even have caregivers. As we moved out of the scrub into the pine forest many warblers were seen and heard. This time the sunlight illuminated their yellow feathers. A red-headed woodpecker was spotted on a dead tree…probably listening for insects. The hike ended with a delightful picnic under the pavilion at Bear Pond. Our take-away: A better understanding and appreciation of what it means to manage through protection, preservation, and restoration of this unique habitat, Seminole State Forest. For many decades, the State of Florida has been purchasing properties necessary to create an unbroken corridor of wilderness connecting Wekiva Springs State Park to the vast acreage within the Ocala National Forest through programs such as C.A.R.L., Preservation 2000, and Florida Forever. Since 1980, the state has acquired nearly 56,000 acres at a cost in excess of $183 million for the Wekiva-Ocala corridor, and more than 25,000 acres are additionally being sought. Acquisition of the land is necessary to provide a wildlife movement corridor and important refuge and habitat for many rare species such as the Florida black bear, the bald eagle, Florida scrub jays, swallow-tailed kites, Florida scrub jays, sandhill cranes, Eastern indigo snakes, Sherman’s fox squirrels, Florida scrub lizards, and gopher tortoises. Another priority is to keep development away from these lands where rain seeps underground to the Floridan Aquifer, which is the source of water for the Wekiva river and dozens of other springs in the area. FOWR has recently been engaged in efforts to secure funding for acquisition of, and a conservation easement over, several hundred acres located within some of the fragmented parcels still being sought by the state for acquisition in the Wekiva-Ocala corridor. 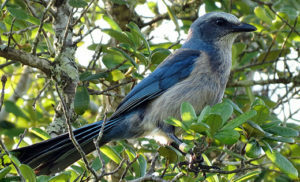 In connection with these efforts, FOWR has learned of a federal grant allocated to the state for a Highlands County scrub jay project where alternative funding has instead been received. FOWR has asked the state to consider allocating the funds to acquire property and establish a conservation easement over two parcels consisting of approximately 200 acres of land in Lake County. Florida scrub jays can be found on one of the parcels, and both scrub jays and Eastern indigo snakes have been documented in the scrub communities on the parcel proposed to be placed under conservation easement. Several state agencies are involved in the process of reviewing and approving FOWR’s request either because they have a role in allocation of the funds or a role in long-term management of the properties. If re-allocation of the federal grant monies is approved, FOWR will have one year to secure additional funds in order to qualify for receipt of the monies from the federal government. The Conservation Trust for Florida has advised it is willing to assist FOWR with securing preliminary appraisals and the necessary fund-raising efforts. A representative from Florida Fish and Wildlife Service has signed off on FOWR’s request and FOWR is now waiting for permission from the remaining state agencies involved. In the 2018 Wekiva Christmas Bird Count (CBC), 53 people endured a relatively rainy and very cloudy day to identify 132 species, and 14,595 individual birds. The number of species observed was slightly higher than the 128 species we have averaged over the last 10 years. The 10 species with the highest number of individuals observed on the count were: fish crow (3607), American robin (1142), black vulture (716), tree swallow (668), white ibis (627), red-winged blackbird (575), turkey vulture (346), yellow-rumped warbler (320), boat-tailed grackle (319), and palm warbler (302). We observed more than 100 individuals of 32 species; we saw 5 or less of 38 species and only 1 individual of 18 species. * “Rare” birds in this year’s count included American redstart, summer tanager, northern waterthrush and yellow-crowned night heron. All these birds are commonly observed in the region or abundant in other seasons in the Wekiva basin, but their lack of regularity in the Wekiva CBC necessitated completion of a rare bird form. * Three species of birds were not detected during the 2018 count though they had been observed on at least 20 of 28. These included northern harrier, herring gull and eastern meadowlark. There continues to be a dramatic decline in eastern meadowlarks, particularly in the last 5 years – we observed 315 in 2007! * Black-bellied whistling ducks continue to be observed in relatively high numbers – they have now been observed in the last 9 counts, and 275 were observed this year. * Wild turkeys, which were not common in the Wekiva basin 30 years ago, have also become firmly ensconced in the count circle, including residential neighborhoods. Nine-two were observed this year, which was near the all-time high. * Including this year, a single horned grebe has been counted 10 times during the Wekiva count – never any more. * We had a near low count of the highly nomadic wood stork (8), but they have been observed on every count. * We observed high numbers of American white pelicans (43), grasshopper sparrow (5) and least bitterns (3), which have only been observed on 4 counts. * We observed only one northern flicker. Northern flicker numbers have been declining from a high of 55, 25-years ago. * We only observed one house finch, a bird that has recently become common in central Florida – we observed a high number of 16 in 2014. I had wondered if this species would be more prevalent since it has now been observed in 10 of the latest counts.